Drew Cloud, Founder Of Student Loan News Website, Was Fabricated : The Two-Way Reporters from The Chronicle of Higher Education discovered that "Drew Cloud" was made up from thin air. The "news" site was created by a student loan refinancing company. The Student Loan Report created a fake identity named "Drew Cloud," who was presented as founder, columnist and editor. The Chronicle was seeking information from "Drew Cloud" because reporters there were skeptical of a survey conducted by The Student Loan Report and published on its website. More than one in five students were using excess money from their loans to invest in cryptocurrency, according to the survey. "Cloud" brushed off the probing reporters and The Chronicle's Chris Quintana published an article with experts who voiced doubt over the survey's findings. But then "Cloud's" digital presence simply "evaporated," reported The Chronicle. So reporters spent a week and a half looking beyond his bio – "a journalist" who "wanted to funnel his creative energy into an independent, authoritative news outlet." Quintana told NPR that a source sent the publication an old email from Nate Matherson, the CEO of LendEDU, a student loan consolidation and refinancing company. The message announced the launch of The Student Loan Report. When The Chronicle reached out to Matherson, he ultimately admitted that Cloud had been fabricated. "I questioned my reporting initially because it was such a wild conclusion to reach," Quintana said to NPR. "There was a little bit of disbelief when we reached the conclusion that he probably wasn't real." As we prepared to launch The Student Loan Report, we debated who should author it, and felt that it was really a blend of our personal experiences and perspectives that would create the best source material, so we created a pen name of "Drew Cloud," and conceived a background that we felt personified a lot of the perseverance we hoped to inspire with The Student Loan Report. When we pictured what Drew Cloud looked like, we pictured a friend of ours from college, so we used his photo (with his permission) to round out the pen name. We used this character of "Drew Cloud" as the primary author of the site -- a shared pen name through which we could share experiences and information related to the challenges college students face while funding their education. Matherson also said that the website had published under other pen names and apologized for concealing the connection between The Student Loan Report and LendEDU. 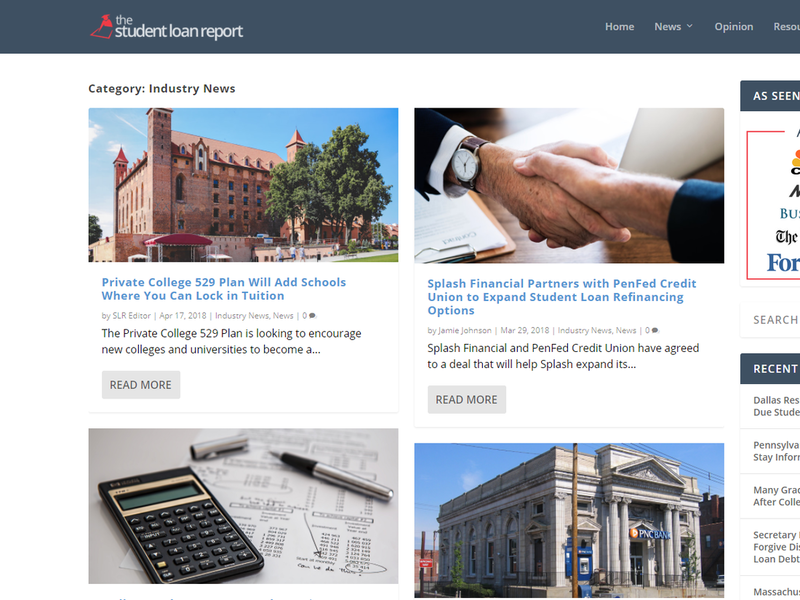 "We have always worked to keep editorial separation between The Student Loan Report and our other site, LendEDU.com, which is our main business. However, there have been nine Student Loan Report articles that mention LendEDU," he said in the message. Ironically, LendEDU's website emphasizes transparency, stating, "As student loan borrowers and consumers ourselves, our goal is to help you save money through transparent pricing and education." Quintana isn't sure how students could be affected. "It's certainly a legitimate question to ask why a student loan refinancing company was running a news website about student loans," he said. Nearly 8,000 visitors went to The Student Loan Report website in April. NPR contacted The Student Loan Report for comment and received an emailed response linking back to the statement. "This is all we are saying at this point," it said.